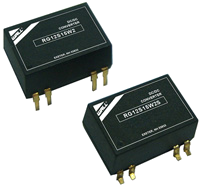 The RGUW2 series of DC/DC power converters provides 2 watts of output power in a 0.74 x 0.50 x 0.33 inch DIP or SMT package without derating up to 85°C. This series has single and dual output models with 4:1 ultra wide input voltage ranges of 4.5-18VDC, 9-36VDC, and 18-75VDC. Some features include high efficiency, low ripple and noise, 3000VDC I/O isolation option, remote ON/OFF, continuous short circuit protection, and no minimum load requirements. All models have UL60950-1 EN60950-1, and IEC 60950-1 safety approvals as well as RoHS compliance. 8. 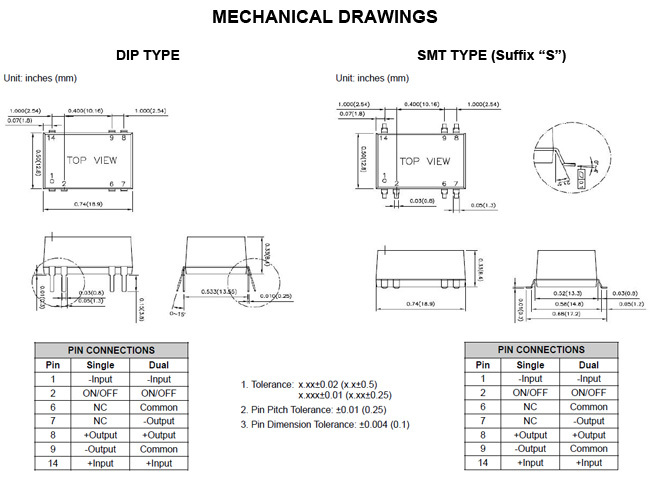 To order surface mount version, add the suffix “S” to the model number (Ex: RG24S5UW2S). 9. To order 3000VDC I/O isolation version, add the suffix “H” to the model number (Ex: RG24S5UW2H). 10. CAUTION: Internal fusing is not included so we suggest using an input line fuse.